On Saturday, April 18 I made a presentation on German church and civil records co-sponsored by the Friendswood, Texas Public Library and the Bay Area Genealogical Society. 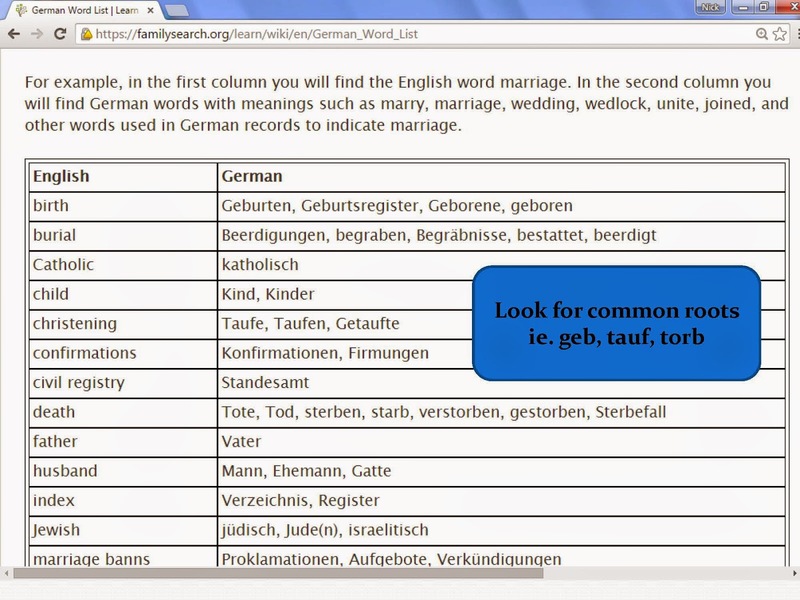 teach how to find German church & civil records either online, on microfilm or in print. I wrote before about the series of books on German Immigrants in American Church Records by Dr. Roger Minert. What I have found is they are a great source if your locality has been covered. Unfortunately for me neither Cleveland nor Milwaukee German Immigrant church records have been extracted. Another problem was the the Clayton Library was in the process of cataloging some of the volumes but they are a great resource for many Midwestern locales. When attempting to locate your ancestors in the church records of Germany you will usually be more successful if you know the German hometown. My previous article about Germany will tell you about how to locate the German hometown. The most common records found in churches are baptism, marriage, and burial. Often times baptism records will include the date of birth but not always. Burial records may not include the date of death but burials usually happened within a day or two of death before embalming and cremation became commonplace. The areas to begin keeping church records were in the western part of Germany. The farther east you go, church records begin later. 1524 -First surviving German Protestant records in Nuremberg. 1540 -Lutheran churches in general began requiring records. 1650 -Most Reformed parishes began keeping records. 1792-1815 -Pfalz and Rheinland church records interrupted by French civil registration. 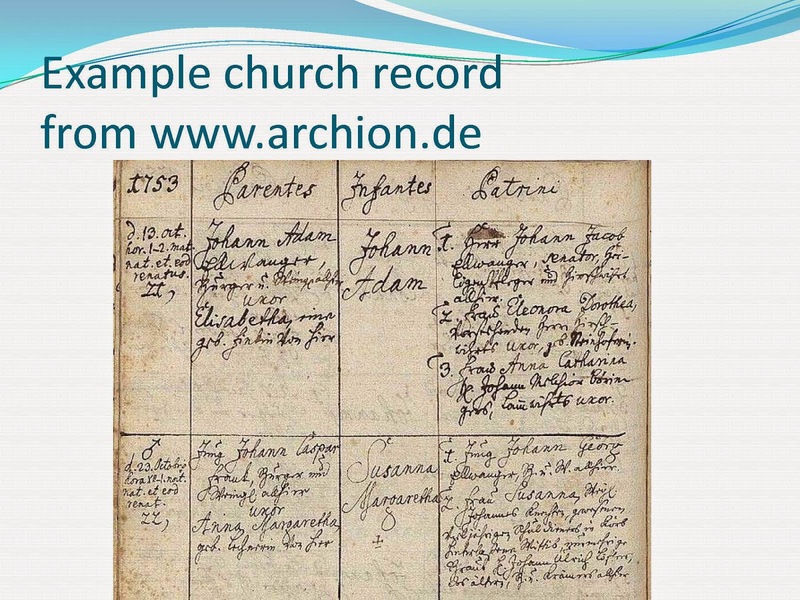 For more information on the history of German church records go here. I recommend that you check Family Search for translation guides to German church and civil records. For example this German Word List is very helpful. Civil record keeping began early in the Napoleonic period but generally very few civil records are found prior to 1876. The Family History Library Catalog is always a good starting place. Search for the German hometown place names and you will find indexed and original church records in online databases and microfilms of original records. 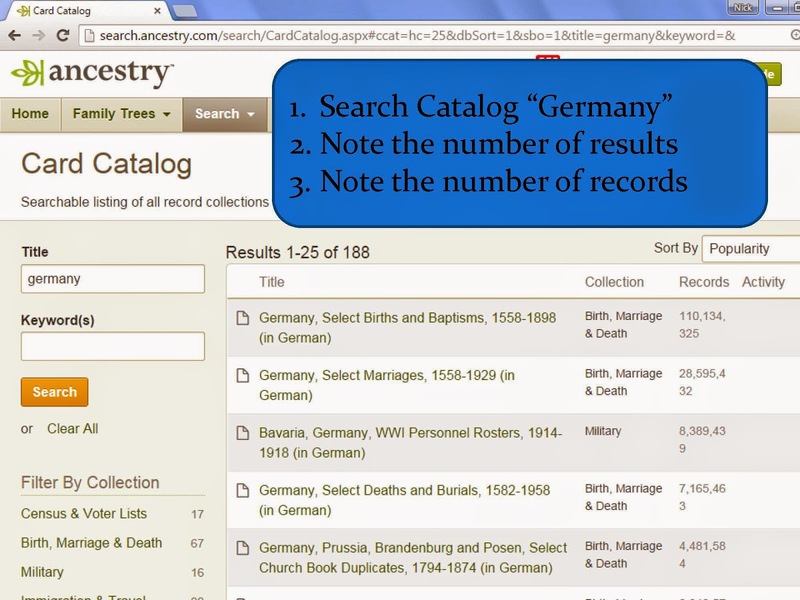 A similar strategy should be used in the Ancestry.com- catalog search the term "Germany"and you will find a list of 188 databases. 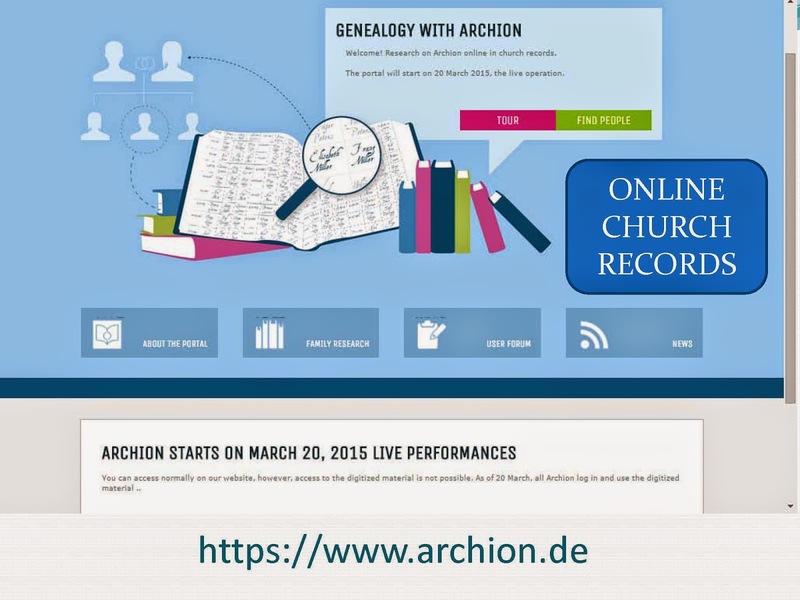 Online Church Records at https://www.archion.de went live on 20 March 2015. 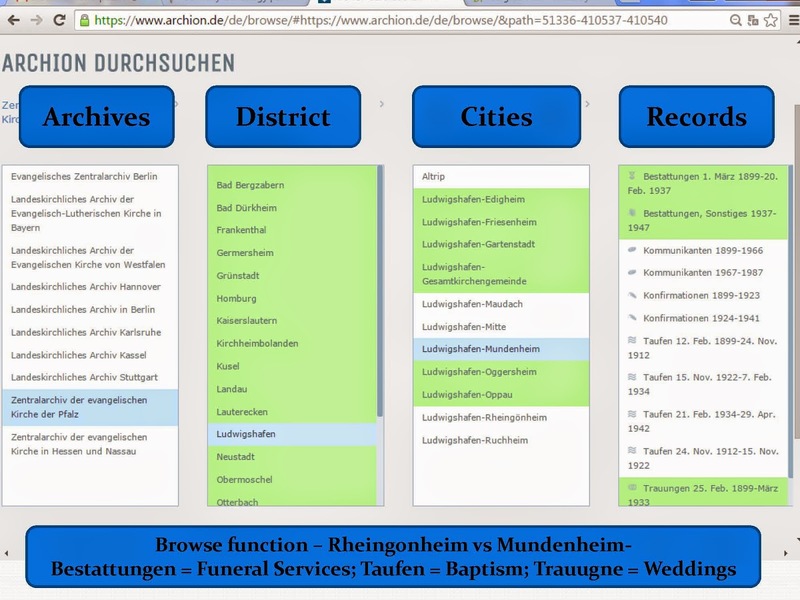 Records at Archion.de are organized by the State or Regional Archive, Districts, Cities/Town, and Record Type. In the image below green means they have records online. Blue highlights the record that you have selected. When you compare Rheingonheim to Mundenheim, you see that not all localities are covered. Here are a few more key words: Bestattungen = Funeral Services; Taufen = Baptism; Trauugne = Weddings. 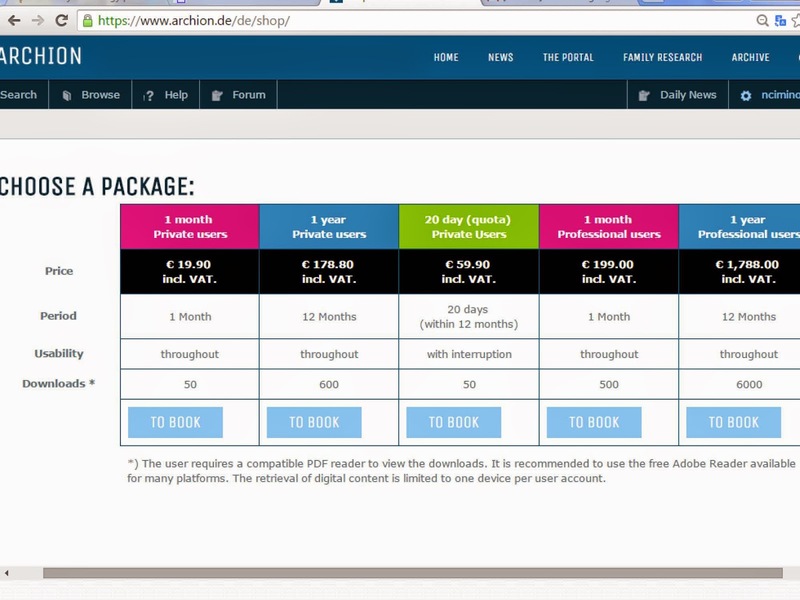 The bottom line is that Archion.de is a pay site. Check to see if your localities are covered before subscribing. The ultimate goal is to get to the original records so this site could be very valuable if your hometowns are covered. 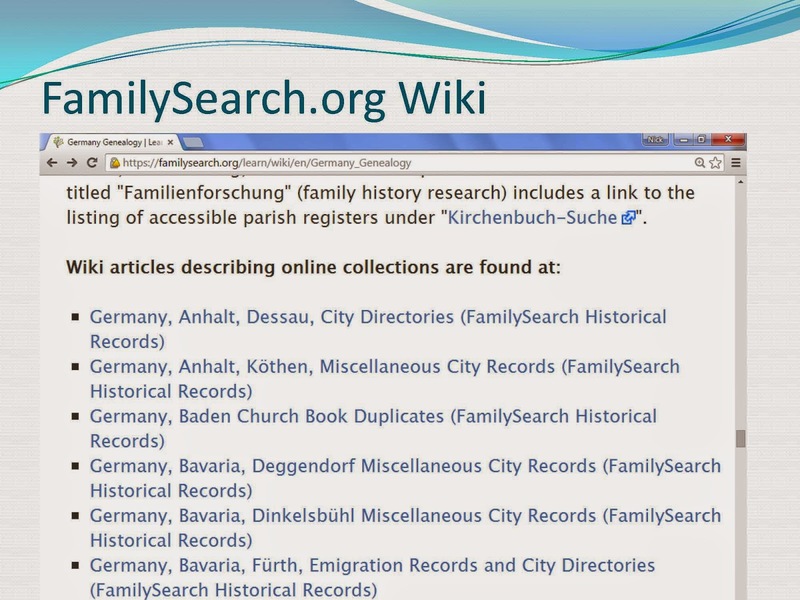 Spend time reviewing the list of online databases available at the Family Search Wiki page on German Genealogy. 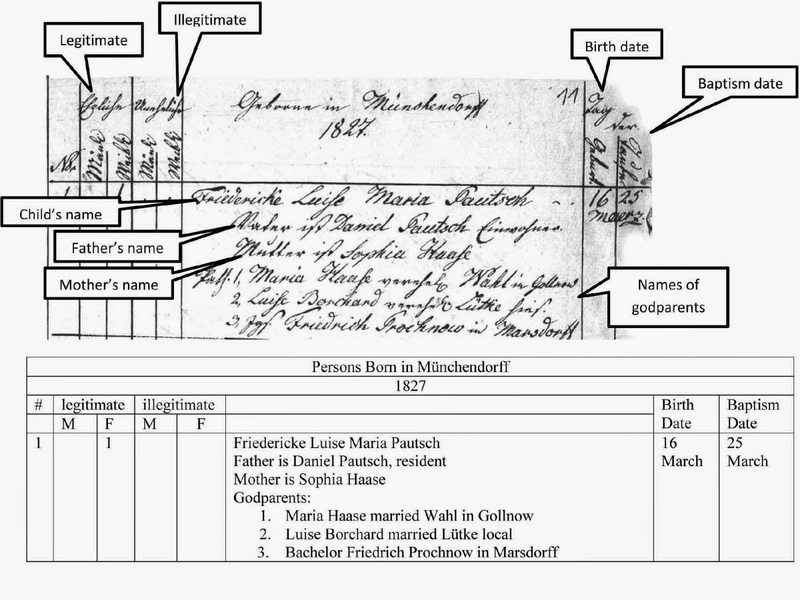 Source: German Genealogy page on the Family Search Wiki. Make sure to use a research log to keep track of the databases searched. Keep track of the searches that were made and the results both positive and negative. Double check the localities, record types and periods covered in online databases and note that on your research log. Search your localities in the Family Search and Ancestry catalogs for online and microfilm. 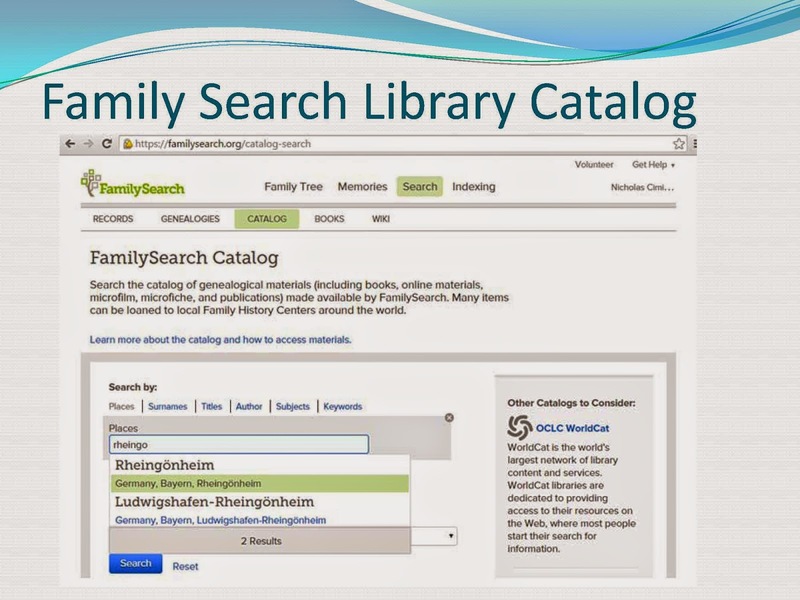 Example of Family Search Library Catalog search for Rheingonheim. 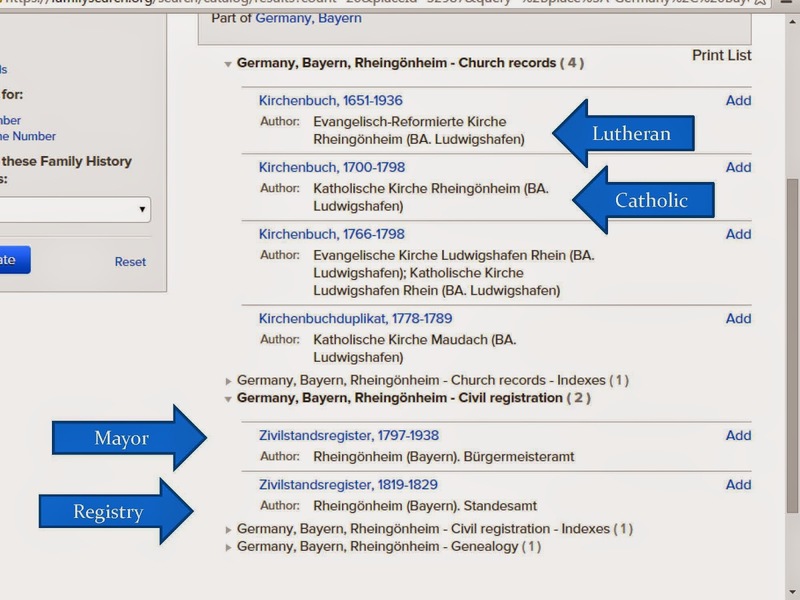 Search results for Rheingonheim showing Church books for both Lutheran and Catholic churches and the Civil Records that are available on microfilm. Search online first, then order microfilm. Try to determine the denomination of the church that you need to search first. Catholics and Lutherans may be recorded in the other church if it is a small locality or if one denomination is predominant in the area. Pay close attention to the description of the type of records and the time periods covered. If you do not find your locality online or in microfilm, try contacting local or regional genealogical societies in the U.S. and in Germany. Some require paid memberships to use their resources. Use Google Chrome to translate German webpages. 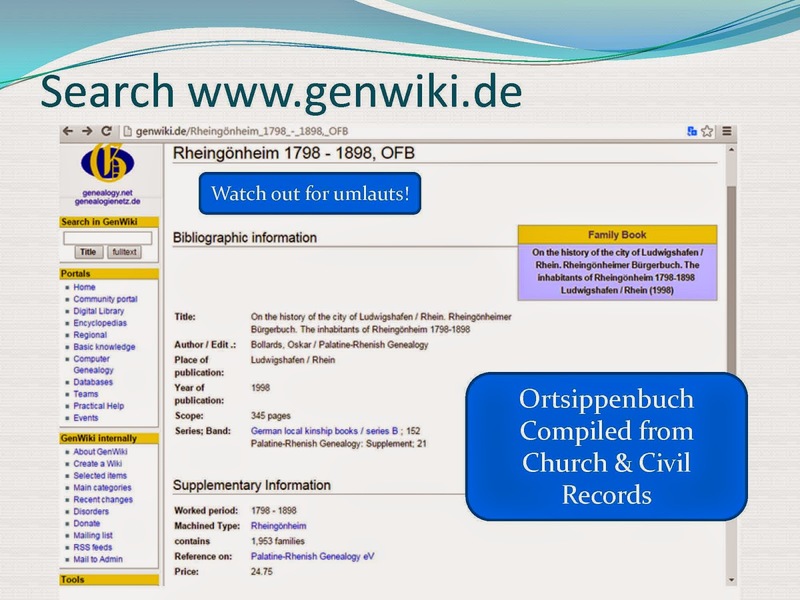 A search of genwiki.de can lead to online sources and published sources available in libraries, archives and through societies. If that fails contact the regional archives or a local genealogist and determine charges for record searches. Search the directory of the Association of Professional Genealogists by geographic specialty for a list of German researchers. Use the drop down list for International. Next German genealogy session presented on Saturday, May 16 at 2 p.m. at Friendswood Activity Building, 416 Morningside Drive, Friendswood, TX.